I was 19 years old in March 1983 when the UK magazine Ham Radio Today published the article “A Low Cost DSB/CW Transceiver for 80M”. Being short of cash and wanting to get on the air, I sent away for the kit and soon after, was surfing the phone portion of the UK 80M band on my new DSB rig. I didn’t get too many QSO’s due probably, to my poor 80M dipole, although G3UMV who lived just a mile down the road heard my home-brew signals and came over to see where they were coming from. The receiver seemed to work very well, and I spent many hours listening to the chatting between 3.6 and 3.8MHz (80M only goes as high as 3.8MHz in the UK). The whole thing was enclosed in an aluminum case and tuned with a Philmore vernier attached to a polyvaricon. I don’t remember any drift, so it must have been stable enough for sideband, and it didn’t have any noticeable microphonics either. As it was my first DC receiver, I didn’t even know that this type of circuit often suffered from microphonics, as this one didn’t have any to speak of. That little rig made it with me across the Atlantic and met it’s end one day in my apartment just a block from Hollywood Blvd. In a passing wave of nostalgia for my earlier radio days, I hooked it up to 12V DC to see if it still worked. It would have, had I not connected the 12V the wrong way round, and if I’d had the foresight as a kid to provide it with reverse polarity protection. I still don’t know why I didn’t just put it aside so that at a later date I could have replaced the damaged active devices. Unfortunately, I tossed it into the dumpster of my apartment building. What a shame – and it had an SBL1-8 mixer too! From time to time either when moving or thoroughly tidying my apartment, I come across the copy of the original article that came with the kit. Trouble is, whenever I looked specifically for it, I could never find it, and the only copy of the article I was able to find on the internet is of too low a resolution to be of much use. I’ve been wanting to recreate this rig for a while and recently, when the desire became too strong to ignore, decided that I was going to find that article even if it took a day or two of searching. It did, but I did. Pure nostalgia wasn’t the main reason for my wanting to build this rig again. A big reason is that I have always been drawn to simple receiver topologies such as regens and direct conversion receivers, yet not all designs are created equal. I remembered this one as working well and on top of that, it used something in the circuit that you don’t see too often in DC receiver designs these days – a passive diode ring mixer package (NE602 anyone?) 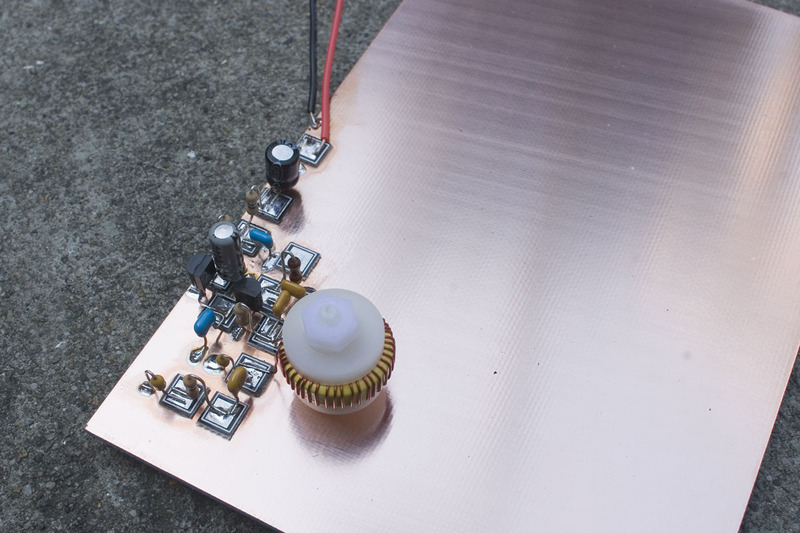 I wanted to build a DSB rig that used a diode ring mixer package, so this is why I am here. The schematics for this rig aren’t that easy to come across. I eventually a found a low-res version of the article online after some searching but it’s not really good enough to work from.,Ham Radio Today is no longer being published, and the company that sold the kit back in the 80’s, G3WPO Communications, went out of business a long time ago. On top of that, Tony Bailey G3WPO is no longer an active radio amateur. 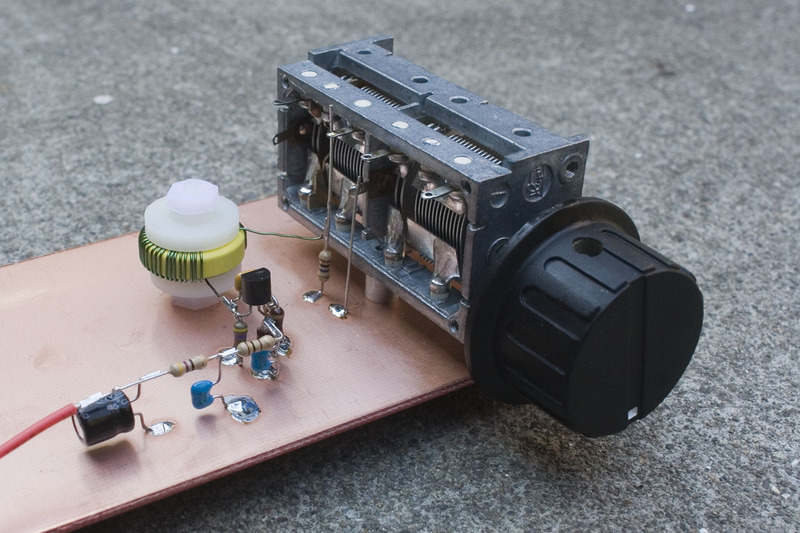 On this page on his website he gives a link to a reprint of an article about another of his projects, the Minisynth VFO. Judging from this, and what he says in the whole of that 3rd paragraph, I don’t think he’d mind my publishing the schematics for the DSB80 here on my blog. That is what I am hoping as I’m pretty sure that some readers will want to see the schematics, and there doesn’t seem to be any other way to get them. I’m having a bit of trouble with the VFO (more on that later), so by showing you photos of my construction and the schematics, I’m hoping someone may be able to help me. I built the VFO first of all. It seemed to work OK and be reasonably stable, with drift of less than 80Hz/hour after warm-up. I know that’s not stellar, but a bit of temperature compensation could help that. Somewhere in between adding the buffer and adding the rest of the receiver, I noticed that the VFO was drifting a bit more and FM’ing, which makes SSB sound pretty bad. However, if I can lower the drift on the VFO and get it to stop FM’ing, I think I’ll have a nice-sounding direct conversion receiver on my hands. There are virtually no microphonics – you have to turn the volume way up and really be listening in order to hear them. For all practical purposes, microphony is just not a problem; something I like very much in a DC receiver. Important – please note that I experienced instability with the buffer transistor Q2 (it wasn’t doing a lot of buffering). I don’t understand why Q1 was coupled to Q2 with a 100 ohm resistor instead of a capacitor, but at the suggestion of K4AHO, I replaced it with a coupling capacitor (I used a 39pF NPO) and put a 100K resistor from the gate of Q2 to ground. My problems with the buffer cleared up and the receiver sounded really great. I’ll publish the schematic of the entire receiver section of this rig in a future post. All the caps marked “poly” are polystyrene. I changed the values of the 2 x 1000pF caps to 1200pF simply because that’s what was available. VFO drift was steadily downwards after the initial warm-up and probably something that could be brought to within useable limits with some temperature compensation work. There are almost no microphonics to speak of (always a good thing in a direct conversion receiver), and only a small amount of broadcast band break-through which is only coming through at the kind of high volumes that will rarely be used. 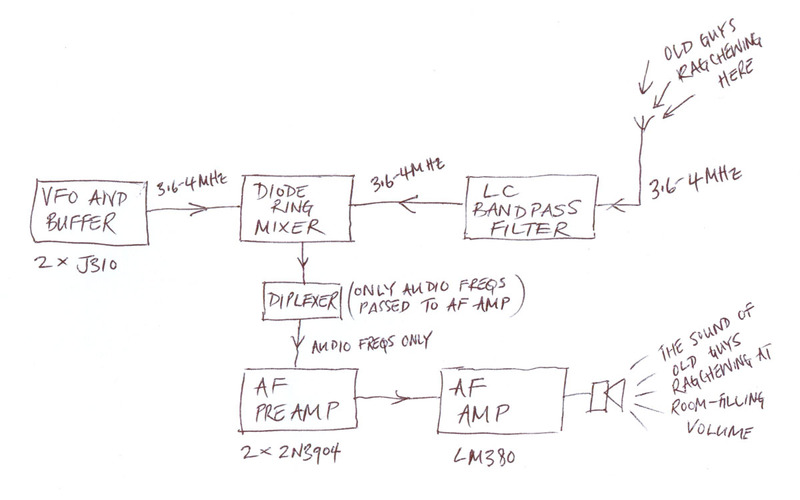 This breakthrough is not coming from the DBM, but from the preamp, which is set for a gain of 1,000 (60dB). 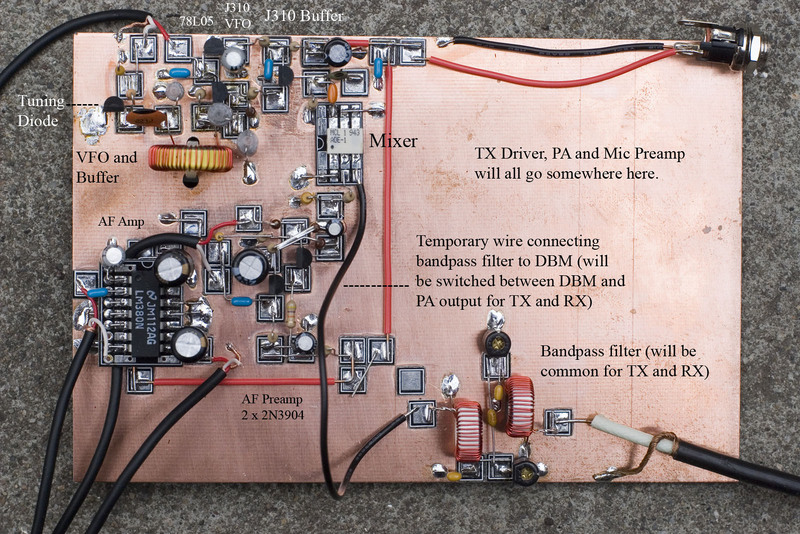 If this rig makes it to a later stage of building, I may reduce the gain of that preamp just a bit – we’ll see. The receiver sounds pretty good on 80M SSB with one big problem – the VFO FM’s when receiving signals, and that IS a problem. Hmmm….but I was using J310’s in this re-creation and was still getting FM’ing of the VFO. As far as I can remember, it was not happening in the original version I had. I noticed that on touching the output of the buffer with a small metal screwdriver, the frequency of the VFO changed by about 600Hz when terminated with the 51 ohm resistor. 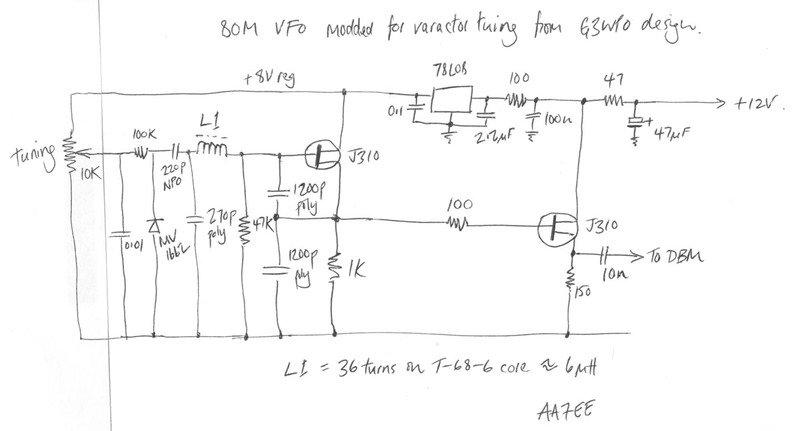 I wonder if this is the reason the VFO I built on the main board FM’s when receiving signals? The only difference between this one and the one that is incorporated into the rest of the circuit as pictured 5 images above, is that the one directly above is tuned by a variable capacitor, whereas the other one is tuned by a varactor. Either way, it suggests to me that I need another stage of buffering. Before I even look at the drift and figure out how to compensate for it, I need to tackle this issue. Posted in Amateur Radio, Ham Radio, QRP, Uncategorized.Tagged 80M VFO, Direct conversion receiver, DSB transceiver, DSB80, G3WPO, G4JST, Ham Radio Today Magazine, QRPMe MePADs, QRPMe MeSQUAREs. Ah, Ham Radio Today. What a great magazine that was! I can remember building two of the WPO Communications kits, the FET Dip Oscillator and the 6m transverter, neither of which I still have (sold, not junked.) Good luck with the 80m transceiver! I’m glad you remember them Julian. Because it was quite a while ago, and also because of where I am now living, not too many people do. Thank you for commenting. Thank you Jim. I’ll be back at the bench tomorrow evening. Will try it and report back then. I very much appreciate you taking the time to leave this comment. 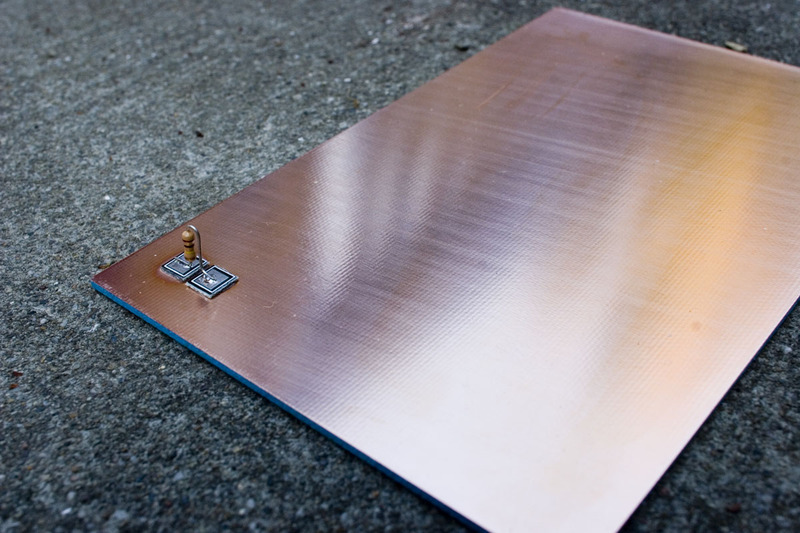 Jim – I substituted a 39pF NPO for the 100 ohm resistor, which led to a dramatic improvement in the stability – haven’t put a high-value resistor from gate to ground yet, but will do so. This direct conversion receiver now sounds really good. Thank you! I’d be seriously tempted to buy it if you did that Nick and the last thing I need is the temptation to spend more money, so please do not put it on eBay! Oh my — some Classic Ugly Construction — atta go Dave! Keep going with your buffer. Need that R to ground for proper self-bias. Strong reverse isolation is your friend — consider a BF998 or hycas buffer? Todd – great to hear from you. I think this might be the first time I have built anything ugly style (or at least the first time since I was a kid!) I did it because, as you know, it is likely to result in greater stability than doing it Manhattan-style. I’m very happy to join the “ugly-club” – feel like I’m now part of a time-honored amateur radio tradition! I just read about hybrid cascode buffers on your site – very interesting stuff. At this point, I’m very happy that this VFO no longer FM’s on receive, so will slowly proceed with the project, but it’s good knowledge to have. 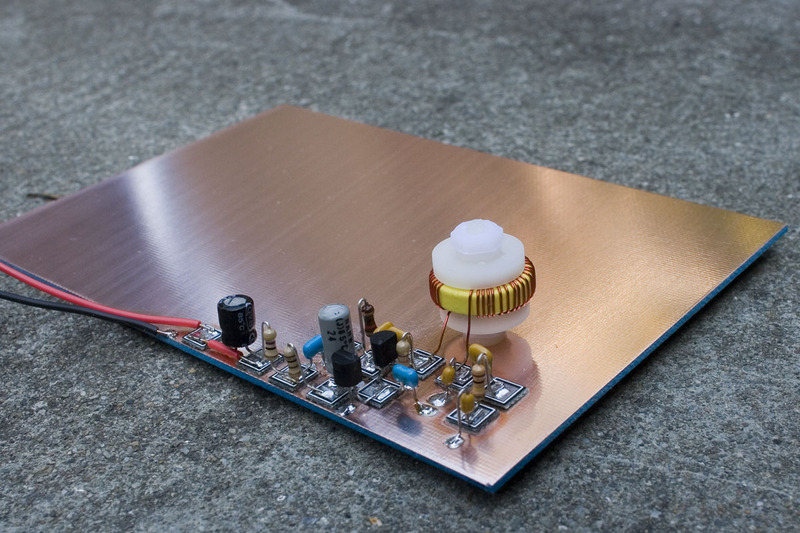 There are many gems on your site that I’ll be referring to – will very possibly be building your 40M Vackar VFO at some point in the future too. I read your blog every weekend and always find it interesting. Thanks fortaking the time to share your experiences. By the way, you are taking great photos of your projects. Could you please write a blog article describinbg your method. Mike – thank you so much for the kind comment. My method is fairly straightforward. I have a way that I take these pictures, and set things up the same way every time. I will either write a blog-post about it soon, or e-mail you the info. Congratulations for “no commercial equipment in shack” ! Can you to give me the totality of the schéma for that DSB80 ? 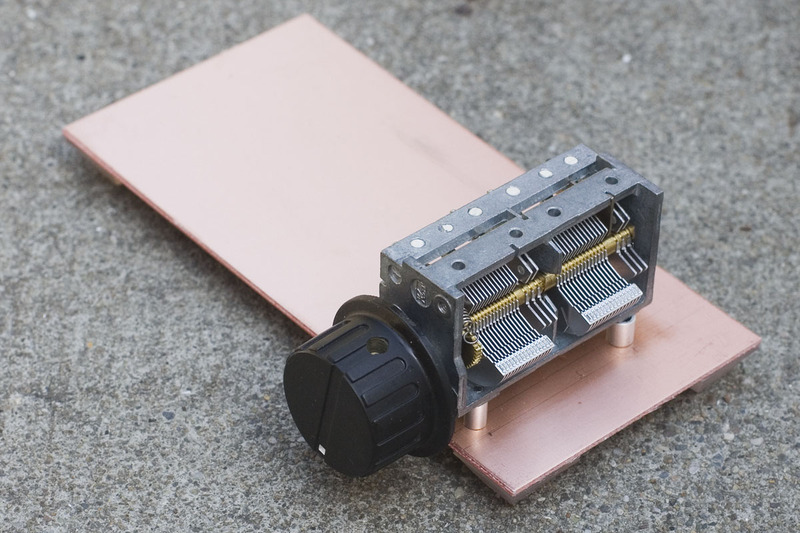 Patrick – I e-mailed you the original article about the DSB80 as it appeared in Ham Radio Today. I didn’t hear back from you. Did you receive it? I also built one of these in 1983 and I still have it… but like you I fried it during a fit of nostalgia. The problem is that I used a standard 2.3mm co-axial power connector but unlike most (all?) 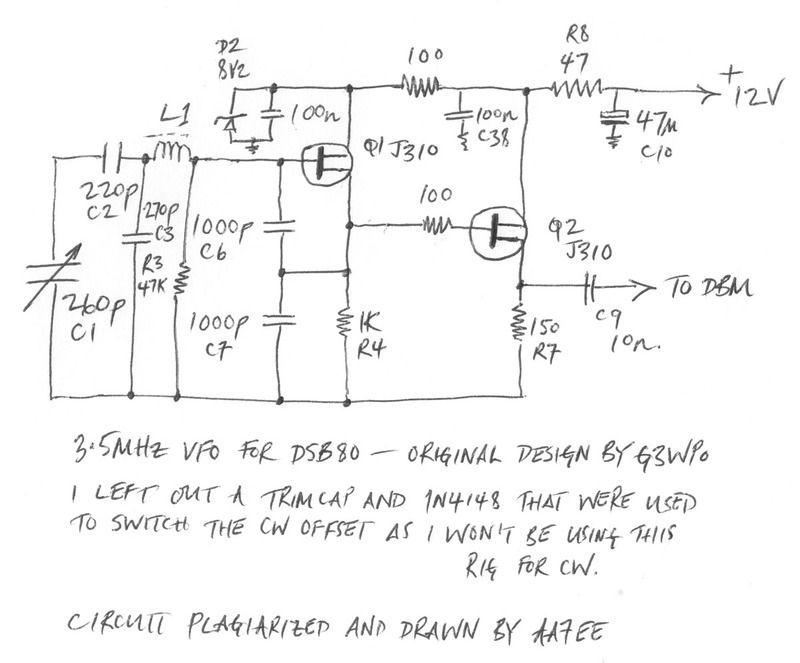 other QRP designs, the DSB80 uses a positive earth and all the shack leads had (and still have) negative earth! I do still have the original instruction sheets and the original Ham Radio Today articles which I could copy and send you if you like… and as I can’t really see myself replacing all the fused components in the RX, I would also be happy to send you the radio if you promise to repair and use it. 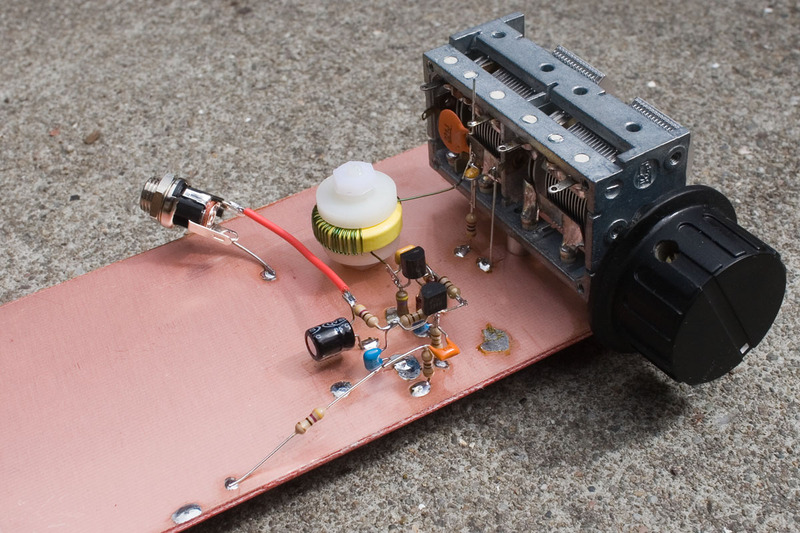 It has some nostalgia value for me because it was the first kit I ever built and I had my first ever QRP QSO using it, so it would be nice if it was back on the air again after all these years. Let me know what you want to do and I’ll get things started my end. Richard – that is a very generous offer. I am very interested. Will be sending you an e-mail shortly. visible for value of components. Joseph – I can e-mail you a copy of the article if you like. Just e-mail me. My address is good in QRZ. Just a word about it though. I like the receiver, but you do have to take some care in wiring up the transmitter side of things. It can be unstalbe unless you’re careful in the way you route the wiring. Ferrite beads and decoupling capacitors come in handy too. I’m no expert myself, but i have had good experience with varactors in vfo’s as opposed to variable capacitors, And i found that replacing the 100k resistor on the wiper of the potentiometer (which most schematics have) with a 470uh inductor, really helps stability. Felicitaciones por tu blog que sigo muy atento, perdona no saber inglés. Puedes pasarme el esquema del DSB80 o SU ARTÍCULO ORIGINAL?. Me interesa montar una versión para 40m. Toni – check your e-mail. The files are big so it is coming over in 3 parts. Hi, would you by any chance know where to find any info on the DSB2? I recently got what turned out to be as DSB2 with a MiniSynth. The RX sounds really nice and I think I’ll get a pleasant little rig out of it. No output on TX though. Everything is FB up until the gate of the MosFet I’m presuming to be the PA. Nice sine wave coming in there on CW TX. But the signal on the drain is all but a nice sine wave. Not much amplification either. I’m suspecting the MosFet to be faulty but it would be nice to find a schematic before I go on tearing down the rig any furhter. Thanks Dave, great material there! Got the files and look forward to reading them as soon as I get home from work today. Glad you got them, Pontus. Good luck! Hi Dave, I am badly in need of ant dsb80 details, I have one , board only and would love to build it. Any help at all would be greatly appreciated. Jules – I’ve got your e-mail address on QRZ. Will send you what I have later today. It may be tomorrow morning your time before you get anything, but I won’t forget you! Como posso adquirir este kit completo para montagem? It is an old kit, from the 1980’s José, and no longer available, I’m afraid.